TARRC was pleased to welcome a high level visit to Brickendonbury from the University of Malaya on Tuesday 18th March 2014. The delegation included Prof. Dato' Dr. Mohd Amin Jalaludin, Vice Chancellor of the University of Malaya, Prof. Dr. Sharifuddin Mohd Zain, Head of the Department of Chemistry, Faculty of Science and Prof. Dato' Dr. Mohd Jamil Maah, Department of Chemistry, Faculty of Science, accompanied by Prof. David Bradley from the University of Surrey. Above: Dr Kamarudin Ab-Malek, TARRC's CEO, briefing the visitors in the Blue room and on the lab tour in the Tyre Testing area and Engineering. The delegation were welcomed by Dr Kamarudin Ab-Malek, TARRC's CEO, who presented an overview of TARRC's historical and future contributions to the Malaysian rubber industry and the scientific accomplishments over the years. The visitors were then given a tour of TARRC's laboratories and briefed on the many areas of work including Tyre Research, Engineering, Mill Room/Industrial Support, Advanced Materials & Product Development, Material Characterisation and Biotechnology. 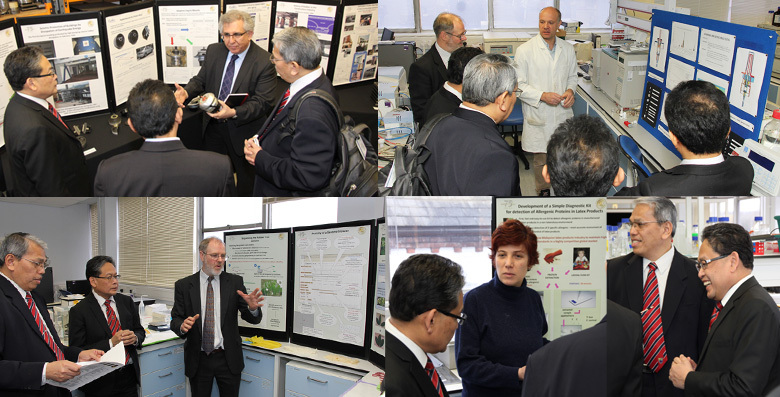 Top left clockwise: Hamid Ahmadi, Head of Industry Support & Engineering Design Division, talking about TARRC's engineering work, Dr Mark Perkins, Head of Materials Characterisation, explaining all things analytical, Dr Andy Chapman, Head of the Materials & Biotechnology Division, describing an aspect of Biotechnology, Dr Alessandra Di Cola, speaks to Prof. Dato' Dr. Mohd Amin Jalaludin about her work in Biotechnology and Prof. Dato' Dr. Mohd Amin Jalaludin enjoying his visit. The visit was made to Brickendonbury to develop future collaborations between TARRC and the University of Malaya to enhance and increase the economic and technological contribution to Malaysia. Dr Andy Chapman, Head of the Materials & Biotechnology Division, who assisted with the lab tour said, 'We were delighted to welcome the University of Malaya to TARRC and were pleased that they were so interested and impressed with our research work and facilities. We are enthusiastic about the possibilities of collaborating with the University of Malaya and the University of Surrey to set up joint programmes of Research and Postgraduate Training'. Above: Dr Kamarudin Ab-Malek exchanges gifts with Prof. Dato' Dr. Mohd Amin Jalaludin and the group share a joke at the end of their visit in the Cedar room at Brickendonbury.